Recently, at the invitation of State Key Laboratory for Oxo Synthesis and Selective Oxidation, Professor Hajime Ito from Hokkaido Universitycame to Suzhou Academy of Lanzhou Institute of Chemical Physics,Chinese Academy of Sciences to have a visit and make academic exchanges. He also made an academic report named “Copper(I)-catalyzed borylation: from the early to current study”. 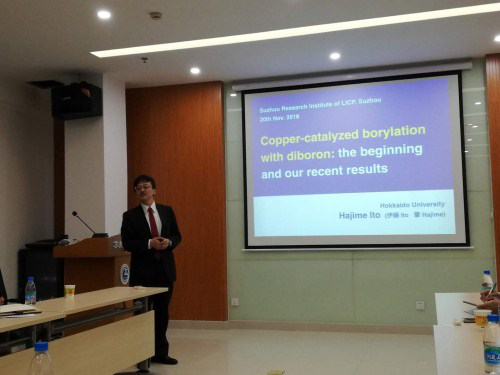 In his report, Professor Hajime Ito introduced the importance of organoboron compound in synthetic chemistry,the history of Copper(I)-catalyzed borylation,the latest development of asymmetric catalyzed borylation and the application of computer aid technology in ligand design and improvement. In 2000, professor Ito reportedCopper(I)-catalyzed borylation for the first time. After that, the report aroused great interest inborylation around the world. Hajime Ito got his doctoral degree of graduate school of engineering, Kyoto University, and his supervisor was professor Yoshihiko Ito. After doctoral graduation,he held the post of assistant professor in department of chemistry and institute for molecular science, University of Tsukuba.He assumed the associate professor indivision of chemistry of graduate school of science,Hokkaido University between 2002 and 2010. In 2010,he took charge of professor of division of chemical process engineering of graduate school of engineering,Hokkaido University. In 2011, he won the President’s Research Award of Hokkaido University. In 2014, he won he Chemical Society of Japan Award for Creative Work.